Unless otherwise stated, Board Meetings are held at the William P. Hobby Building, 333 Guadalupe, Austin, Texas. The Board files an agenda at least seven days before each meeting. At each meeting, a time-certain is established on the agenda for public comment. Adopted Rules: Adopted amendments to Rule 22 T.A.C. §280.10 concerning requirements for the prescribing of analgesics that are classified as Controlled Substances. Adopted Rules: Adopted amendments to Rule 22 T.A.C. §273.8 concerning restrictions on license renewal when administrative penalties are unpaid or when a licensee has not complied with disciplinary orders or agreements. Also adopted new rule Rule 22 T.A.C. §277.12 concerning disciplinary actions authorized as amended by Senate Bill 314, 85th Legislature, regular session. Proposed Rules: Proposed amendments to Rule 22 T.A.C. §280.10 concerning requirements for the prescribing of analgesics that are classified as Controlled Substances. Will be published in the September 21, 2018, issue of the Texas Register. Proposed Rules: Proposed amendments to Rule 22 T.A.C. §273.8 concerning restrictions on license renewal when administrative penalties are unpaid or when a licensee has not complied with disciplinary orders or agreements. Also proposed new rule Rule 22 T.A.C. §277.12 concerning disciplinary actions authorized as amended by Senate Bill 314, 85th Legislature, regular session. Will be published in the May 4, 2018, issue of the Texas Register. Adopted Rules: Adopted amendments to Rule 22 T.A.C. 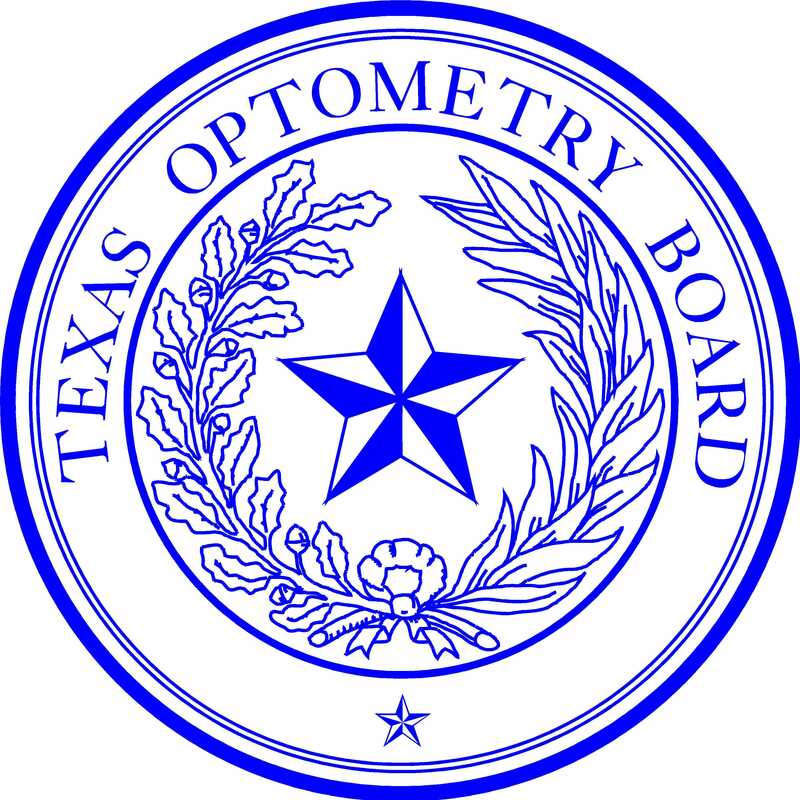 §273.6 concerning the addition of a new license for military optometrists volunteering to provide charity care in House Bill 2933, 85th Legislature, Regular Session. Adopted Rules: Adopted amendments to Rule 22 T.A.C. §273.4 concerning renewal fee changes under authority of Senate Bill 1, 85th Legislature, Regular Session, Article IX, §§18.34, 18.49 and 18.20. Adopted amendments to Rule 22 T.A.C. §277.1 to enable amendments by Senate Bill 314, 85th Legislature, Regular Session, concerning requirements to keep complainant’s name confidential and prohibition on accepting anonymous complaints. Also adopted new Rule 22 T.A.C. §277.11 to enable amendments by Senate Bill 314, 85th Legislature, Regular Session, concerning procedures for physical or mental examination. Proposed Rules: Proposed amendments to Rule 22 T.A.C. §273.6 to enable amendments by House Bill 2933, 85th Legislature, Regular Session, concerning licenses for military optometrists volunteering to provide charity care. Adopted Rules: Rule §271.2: Changes to application procedures required by Senate Bill 314. Also amendments to Rule §273.8 concerning criminal history required by Senate Bill 314 to renew license. Proposed Rules: The board proposed amendments to §273.4 concerning fee changes required to access national license databank and assist with the funding of the Prescription Monitoring Program. The board also proposed amendments to §277.1 concerning requirements in Senate Bill 314 regarding anonymous complaints and confidentiality of complaint process. New §277.11 was proposed with guidelines for ordering a physical or mental examination. The proposed amendments were published in the September 8, 2017, issue of the Texas Register. Proposed Rules: The board proposed amendments to §271.2 concerning changes required by Senate Bill 314 to the application process. The board also proposed amendments to §273.8 concerning criminal history requirements in Senate Bill 314 for optometrists renewing their license. The proposed amendments were published in the June 23, 2017, issue of the Texas Register.